Still, it should be noted that 43% of iPhone and iPad owners continue to use iOS 7. 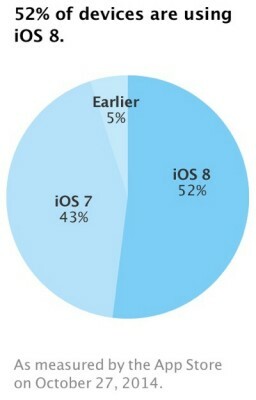 5% of users, mostly people who own older devices, utilize iOS 6 or even an older version of Apple's OS. iOS 8's installation numbers have increased approximately four percent over the course of the two weeks, which means adoption numbers are on the rise after several weeks of stagnation. During Apple's October 16 iPad-centric event, Apple CEO Tim Cook said that iOS 8 was installed on 48 percent of devices as of October 13, and before that, the OS was installed on 46 percent of devices on September 21. The adoption rate is expected to rise even more as the guys from Cupertino have recently launched their own mobile payments system, which works only with iOS 8.1. I think that a wide number of people will want to test this system, especially after its launch in new countries.